According to today’s news reports and long-standing rumors, Central Intelligence Agency (CIA) Director Leon Panetta will be named Secretary of Defense very soon. 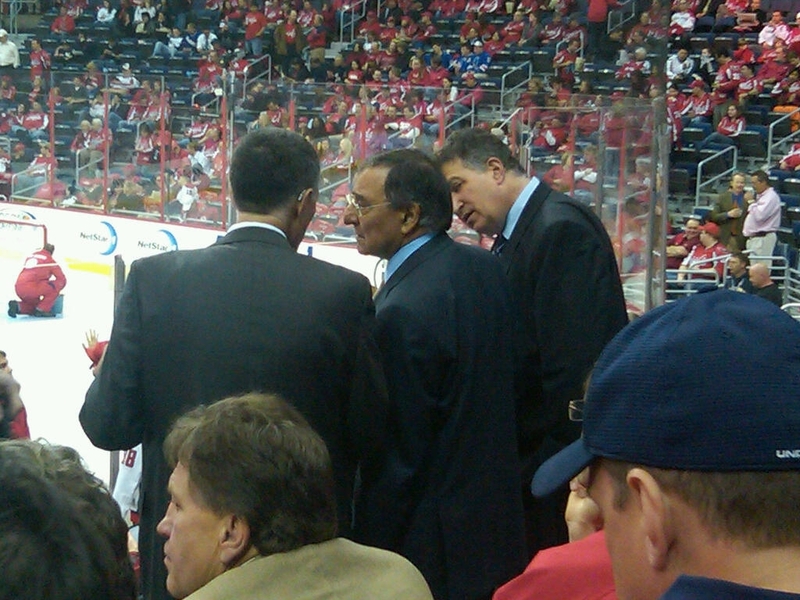 Panetta is a “Washington insider” and also a Washington Capitals fan. This photo was taken by a Caps fan just days ago during the first round playoffs at Verizon Center. Clearly Panetta knows a thing or two about the Caps, defense, and intelligence. How best to describe the Caps defense? Intimidating? Maybe. Intelligent? Yes. While Michal Neuvirth is clearly the “Secretary of Defense” for this team right now, the strength of the Caps defense is much broader. Of course, there is the rock solid commitment of Coach Boudreau and the great defensemen mix of young talent (see John Carlson) with valuable experience (see Scott Hannan). But the truth is, when we think “defensive player,” we also think of players like Jason Arnott and Brooks Laich. The team may be scoring fewer goals, but “the best offense is a good defense” and that is what will win games during the playoffs (or is it “the best defense is a good offense?”). Anyway, the Caps now have an intelligent approach to their defensive game and took the critical time (mid-season) to commit themselves to it. So we have a proposed “revamping” of our national security team and a completed “revamping” of the Caps strategy… and a great photo of Panetta at a Caps game. Go Caps!